Getting a new horse is very exciting, but adding a new horse to your herd (even if it's a small one of two or three) can result in a few tense moments and some worry on your part. Horses are herd animals and when several live together they quickly develop a hierarchy with leaders and followers. Quite often there will be one leader who has a favorite sidekick, some followers, and the underdog. Horses figure this hierarchy out for themselves with little interference from their human owners. Regardless of how you integrate the newcomer to the herd, you will probably want to keep the new horse separate until you're sure it's healthy and free of disease. If you don't normally keep halters on your horses when they're outside, this might be the one time you put breakaway halters on at least the herd leader and the newcomer so they can be easily caught if necessary. Check the pastures and stalls for hazards that a horse might encounter as they try to get away from the other horses. If the footing is very icy or muddy, hold off until conditions improve. Chances are, if you just have one or two horses, they'll welcome the newcomer very quickly. There will be some posturing, prancing, tails up, sniffing, and squealing but because horses like being in herds, they'll probably settle in very quickly. Turning the horse out in pastures or paddock alone may help it learn the lay of the land and familiarize itself with the smells left behind by the other horses. There are a few schools of thought when it comes to introducing a new member to a larger herd. Many people simply put the new horse in with the others and let them sort things out for themselves. Quite often this works, and occasionally it does not. It usually works best with horses that are known to be followers and not herd leaders. Some horses, often the newcomers, will end up with bite marks or get kicked in any scuffles that may transpire. As long as everyone has lots of room to get out of the way, the herd usually settles in with a minimum of fuss and the new member takes its "assigned" position in the herd pecking order without question. If the newcomer is very assertive and feels it should become the new leader, it may make time for everyone to settle into the new order. It's important to keep a watchful eye to separate the new herd member out before someone gets hurt. 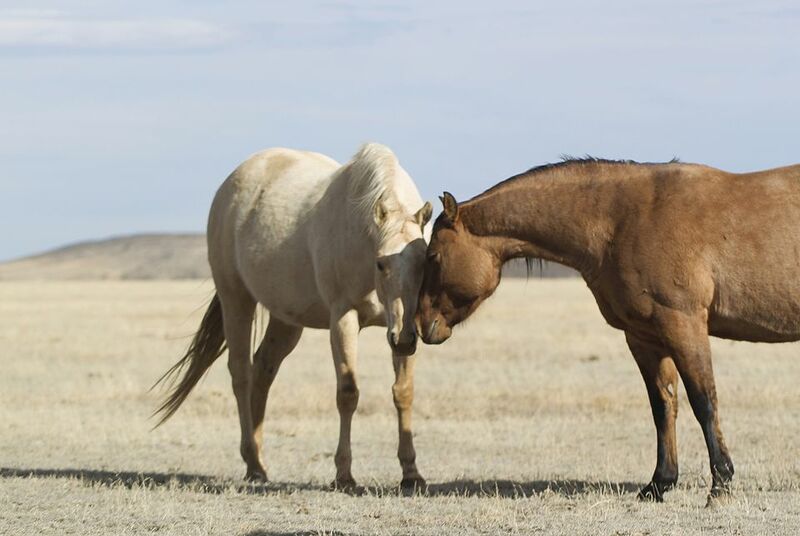 There is the occasional mix that just doesn't work and some horses—often those who are quite dominant—can't live together safely. Some horse owners choose to introduce a new member to the herd gradually. This includes keeping the horse within view, but not within touching distance of the existing herd. After they've had a chance to smell and see each other from afar, they can be moved closer together in neighboring paddocks. This can be as tricky as putting them together if they decide to strike out at each other, bite, or kick through the fence. Again, a watchful eye is required to make sure that any scuffles don't result in injury. The time they are exposed to each other can be increased slowly until they are quiet and used to each other. After everyone gets used to one another, separated by a fence, the horses can be put together. Just because the horses were right next to each other and had plenty of time to sniff noses doesn't mean there won't be any squealing, biting, kicking, or galloping around when the new horse is put in with the others but chances are the initial excitement will wear off a bit quicker and the herd will settle into its new structure. Another way to introduce a new herd member is to turn the newcomer out with the others, one at a time, and add in more. This gives the horse time to bond with one or two members at a time, with the leader added in last of all. You'll know your horse has been fully accepted into the herd when they all graze together and the bickering has stopped. There's always a small risk of one horse injuring another, even well after the introductions are over. The chasing and other excited behaviors should end as the new horse becomes an accepted member of the herd.